Whether you're working on a home improvement project or doing something in your workshop, cutting large boards can be a challenge. The circular saw is a versatile tool that is designed to cut straight lines, but to use it accurately, you need to have a guide. It's similar to drawing a straight line free hand versus using a ruler. Here are three ways to cut straight and constantly accurate lines with the circular saw. The most common cut using a circular saw is cutting a board to length. It's standard practice to use a square held in place to guide the saw against so the cut is square and straight. The challenge with this is lining up the blade of the saw to your cut line. It means having to slide the saw right or left until you're happy with the position. There's a better way. Making a saw guide to cut across a board is an easy project and so worthwhile. In the video, you will see that it's made from a piece of paneling and two straight edges. The first straight edge is attached to the bottom of the panel. Then the second board is attached on top, making sure it is square to the other board. Once it is assembled, the saw is run across the guide and the excess material is cut off on the right side, revealing the edge where the saw blade will always cut. The advantage of using a cross cut guide is that it's very easy to know where the blade will cut, so it's faster and more accurate to use than using a square for a guide. By making the guide board long, you also have a larger reference surface to guide the saw before you start the cut. This saw guide is well worth making. Similar to the cross cut saw guide, a plywood saw guide has a base and a straight edge. The saw guide is clamped to the plywood to ensure it doesn't move during the cut. The saw is run against the straight edge to ensure an accurate cut. You can watch this being used in the How to Cut Large Boards video. To make a plywood saw guide, you will need a long, straight edge. The best place to cut off the outside edge of plywood. The edge of plywood is referred to as the factory edge, because it is cut by the manufacturer who uses very accurate machinery. 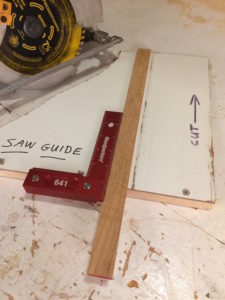 Many home improvement stores have the ability to cut boards for customers, so make use of that service to cut the boards to make this saw guide. The plywood saw guide is made with two pieces of wood; one for the base and a second one on top for the straight edge. 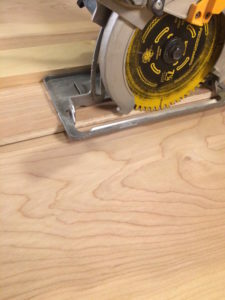 Attach them together with screws, leaving more plywood on the cut side of the edge than what you need as the first saw cut will trim this off. After your first cut, you have an edge where you know the saw will cut, making it easy to line up you saw guide for perfect cut every time.